Hi! My name is Kenzi and im 16. I am enrolled at South High and MCTC. I am a hardworking student and photographer. I have always had a love for animals since I was very young. 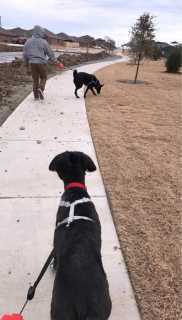 I currently have a Giant Schnauzer Lab mix named Quinn. She is about 85 pounds and just turned a year old. She is trained and very well behaved. I have trained my own dog(s). But no professional experience. I have also pet sat before. I will pet sit/ walk any animal you need! Mckenzi's service is located in or nearby Minneapolis, Minnesota. Book via PetBacker for Insurance, Payment protection & 24x7 support. If you have hired Mckenzi before, leave a review now. Contact Mckenzi now with your pets info. If Mckenzi is busy, we can help include similar Backers.